Your home is one of the most valuable asset that you possess. When looking for a real estate agent you will want to find someone who understands you have worked hard to achieve home ownership and will protect and help you build on that investment!! 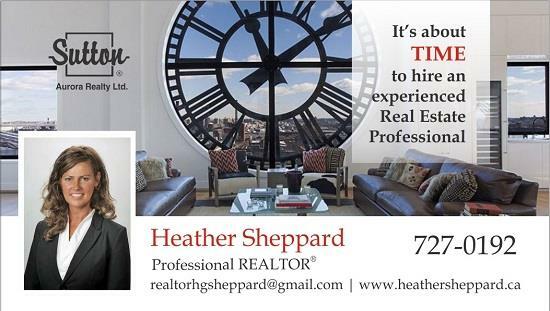 Professional real estate/new home construction consultant Heather Sheppard has been involved in the Real Estate Industry since 2005 in Alberta and since 2009 in Newfoundland. She combines seasoned expertise and innovation with unwavering tenacity, dedication, integrity and an infused personality that makes her a pleasure to work with. Heather has been a national and provincial award winning realtor who prides herself on professionalism and exceptional customer service. With almost 15 years of Real Estate experience, 8 years in new home construction, she has the knowledge and experience to guide her clients through the sometimes intricate New Home Construction process as well as providing her expansive client base with superior existing home sales knowledge & services in Mt. Pearl, St. John's, St. Philips, Bay Roberts, CBS & surrounding areas. As an investor herself in the local real estate market, she can provide beneficial financial knowledge and investment strategies in the acquisition & disposition of investment properties to build a strong real estate portfolio for financial leverage and future stability. ​Acknowledged for her track record of success, negotiation skills, exception customer service, unsurpassed discretion, networking and marketing expertise, Heather consistently delivers best-in-class results for every Buyer and Seller she represents. Whether you are looking for your dream home or selling your current property, Heather is your prominent resource for all your real estate related needs. Are you interested in knowing about your market area? Please feel free to contact Heather to customize the market information for your area. Are you thinking about purchasing or selling real estate in the near future? I am looking to expand my portfolio and would greatly appreciate the opportunity to work with "YOU"